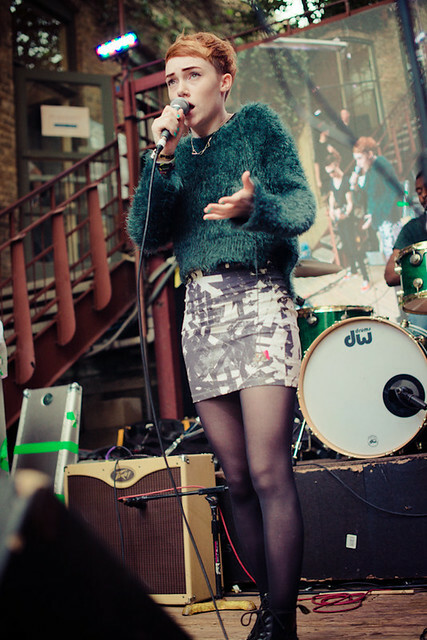 Chloe Howl's first U.S. performance was at SXSW's Cedar St. Courtyard sponsored by Filter Magazine. Friday started off with Filter Magazine's showcases featuring Swedish and British acts held at the Cedar Street Courtyard. 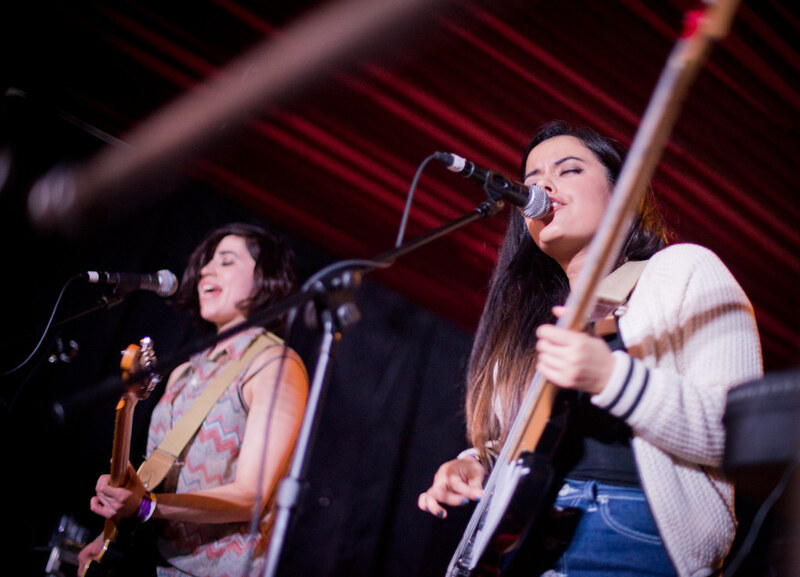 More than eight showcases marks FILTER Creative Group’s continued dominance into Austin, TX, bringing some of the festival’s most highly-touted brands and exceptional musical performances to the SXSW Music Festival this year. Kristal and Jonny Boy, an experimental art duo sounded just as they looked. 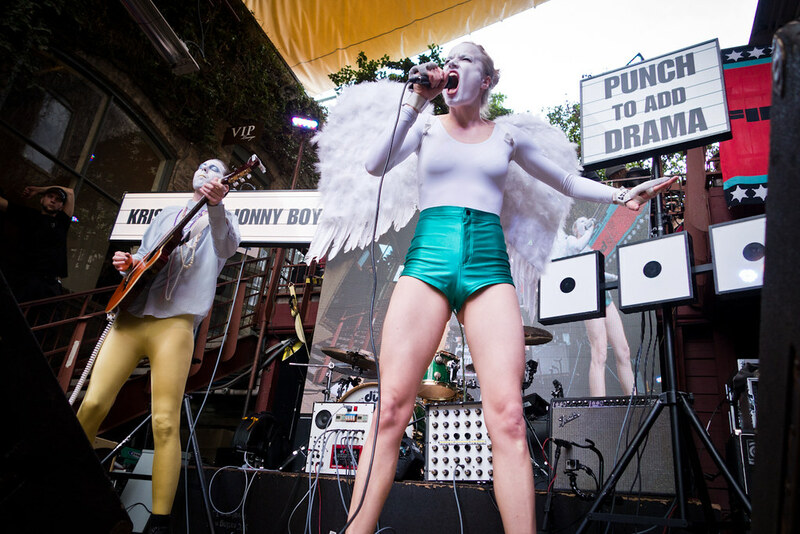 Painted in white make-up and donning angel wings, lead singer Kristina Hanses striked powerful poses - a complete contrast to their songs fragile and delicate tunes that made it seem like we were watching a child's music box come to life. Their style of dream-pop made you believe that dreams can come true. I would've loved to see their show under colorful stage lights to go with their colorful performance. But under this overcast day, Kristal and Jonny Boy were the only thing shining brightly at this moment. Next up was the Swedish trio Like Swimming who I had been following since they were in a much larger band called You Say France and I Whistle! They've since gone to a three piece band and their sound has also gone simpler but what they kept was their knack for writing simple, catchy and infectious songs. Take a listen to "Go Buffalo," their first single off their new record. British singer Chloe Howl's SXSW didn't start off the way she had planned. Having found success in the UK with her debut EP Rumour which spawned her hit singles "Rumour," "No Strings" and "Paper Heart" she was making her trek across the pond for her first ever U.S. performances. Unfortunately, due to her band having visa troubles, they couldn't make the trip with her in time for her first four shows at SXSW which were cancelled. On Friday, Filter Magazine's Cedar St. Show sponsored by Onitsuka Tiger officially marked Chloe Howl's first show on U.S. soil and those waiting finally got a chance to see why Howl, the recent BRIT Award nominee, was named by BBC's Sound as having one of the most highly anticipated albums coming out this year. 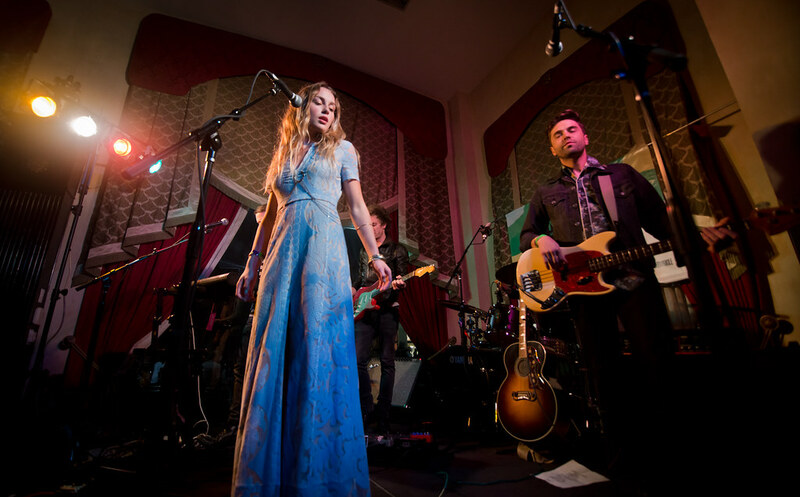 Zella Day performs at The Driskill Hotel. Keeping in the spirit of SXSW, I decided to, on a whim, walk into a venue and just listen to who was playing. Enter Zella Day, the LA-transplant with her whimsical folk/pop melodies that conjures images of fruitful rains on barren landscapes that, in one minute can be cracked dry, and the next, sprouting with bright, lush poppies. Her songs are simple yet complex but it's her voice that, like someone taking you by the hand and leading the way, draws you into her world. Listen to her singles "Sweet Ophelia" and "1965" to be transported into her world. Sisters Vic and Gab at The Soho House. For Tegan and Sara fans, Milwaukee's own sister duo Vic and Gab should be added to your playlists. And just like the Canadian twin sisters, these sisters also trade off and share vocal duties. Infectious playful songs that are beat and bass driven are their forte along with their sweet harmonies that barely rise above a sultry whisper that. You won't be disappointed. Just ask the crowd at The Soho House who spontaneously broke into dance in the middle of their set. Yep, their songs are that catchy. I even noticed my hips swaying side to side. Seriously, check out "When You Walk Into a Room" now!!! London Grammar's haunting melodies filled Stubb's during SXSW. And then there's London Grammar, the London trio consisting of Hannah Reid, Dan Rothman and Dot Major. Under the lush and saturated Stubb's lights, London Grammar performed to a venue filled to capacity - about 2000 people under the Austin stars. Heavenly would be the word when describing their music. Hannah's vocals are hauntingly beautiful; trance-like and moody enough that you'll get lost in their hypnotic world. Their album If You Wait, released last year debuted at #2 on Billboard's UK chart and spawned off their hit singles "Strong" and "Wasting My Young Years." And finally, Deap Vally, the hard-hitting, rock outfit from Los Angeles killed it at Old School. It's still a wonder who this duo of Lindsey Troy and Julie Edwards and manage such a huge sound complete with killer riffs and earth-shattering drumming from Edwards. Their recently released debut album Sistrionix is rock at its finest with no apologies with ferocious vocals that can only come out of Troy.